Avon Fire & Rescue Service (AF&RS) has welcomed the outcome of a court case in which two businessmen were successfully prosecuted for failing to comply with the Regulatory Reform (Fire Safety) Order 2005. Mr Edward Smith, from Bridgwater Farm, Dundry, was sentenced to two months in prison, suspended for 12 months and ordered to pay costs of £12,697.68. He pleaded guilty to the five charges against him at North Somerset Magistrates Court on Thursday 2 May. The prosecution was brought by AF&RS after a fire at the premises, in May 2012, when it was being used as a bed and breakfast business. North Somerset Magistrates Court heard that Mr Smith had failed to complete a fire risk assessment; ensure that the premises was equipped with fire detectors and alarms; and none of the emergency exits or routes were properly illuminated. There were no established procedures for fire, such as notices in rooms to inform guests about what to do in the event of a fire, and there were no self-closing fire doors in the premises. In the second prosecution Mr Garreth Wilson was given a four month -custodial sentence, suspended for 12 months, and ordered to pay costs of £10,186.56. The charges were brought against Mr Wilson after a fire at a house of multiple occupancy, at Nine Tree Hill, Cotham, Bristol, on 14 January 2012, where two women had to be rescued from the roof by firefighters. Following an investigation by AF&RS a number of breaches of the Fire Safety Order were found. There was no evidence that a fire risk assessment had been carried out and no records relating to maintenance of the alarm system, emergency lighting or fire extinguishers. Because of their severity, both cases were referred for sentencing on Friday 21 June, to Bristol Crown Court. In his summing up His Honour Judge Martin Picton praised AF&RS for pursuing the case and highlighted the hard work which had been undertaken by the service to bring the case to court. He said the situation was wholly unacceptable and that there is a huge obligation for landlords and business owners to ensure their premises are safe as fires can be hugely dangerous. Head of Technical Fire Safety for Avon Fire & Rescue Service, Group Manager, Matt Peskett, said: “We are satisfied with the outcome of both these court cases and believe the sentences passed down today reflect the severity of the charges. “In both these cases lives were put at risk because of failures to ensure safe accommodation is provided for residents in the event of fire. “Part of the role of the fire and rescue service is to enforce the Regulatory Reform (Fire Safety) Order and ensure all business premises and public places comply so people are safe when inside. “Landlords should be aware that where they provide accommodation they have a duty of care and moral responsibility to look after their guests and residents. They should carry out a risk assessment and ensure their premises are up to the appropriate standard. “Failure to do so may result in loss of life, as there very nearly was in both these cases. Where this comes to our attention, whether there is a fire or not, this may result in prosecution. The Regulatory Reform (Fire Safety) Order 2005 applies to all non-domestic premises in England and Wales. A responsible person must carry out a fire safety risk assessment and implement and maintain a fire management plan. AF&RS works closely with businesses to ensure they comply with the regulations and staff are available to offer practical advice and assistance in this area. 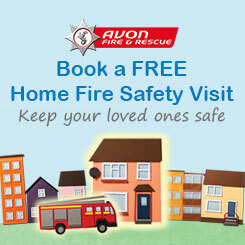 About 400 people a year die in accidental fires in the home.